This page covers the lighthouses of the three southernmost states of the Brazilian coast: Paraná, Santa Catarina, and Rio Grande do Sul. The northern part of this coastline features beautiful sandy beaches framed by steep, sometimes mountainous headlands with a scattering of offshore islands. Rio Grande do Sul is different: its coastline is mostly a very long and generally roadless beach, broken at the entrance to the estuary for which the state is named. The Portuguese word for a lighthouse is farol, plural faróis. Like the Spanish word faro, the word farol applies to all light towers, whether they are enclosed structures or not. 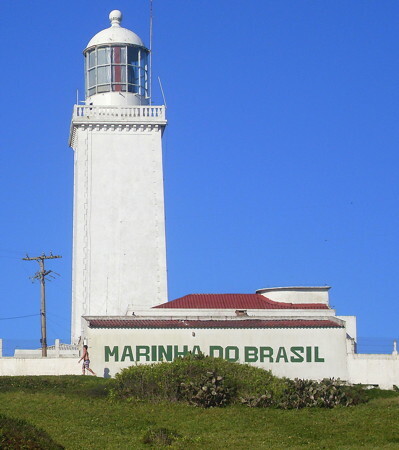 Active lighthouses in Brazil are owned by the navy (Marinha do Brasil) and maintained by the Centro de Sinalização Náutica e Reparos Almirante Moraes Rego (CAMR) in the Diretoria de Hidrografia e Navegacão (DHN). Many of the larger lighthouses are staffed by resident keepers or by rotating crews of naval personnel. 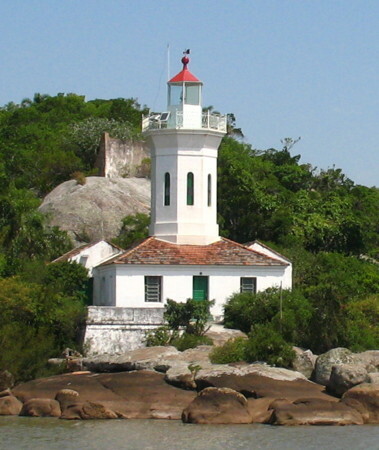 Only a small number of Brazilian lighthouses are open to the public. ARLHS numbers are from the ARLHS World List of Lights. BR numbers are from the official Brazilian Lista de Faroís. Admiralty numbers are from volume G of the Admiralty List of Lights & Fog Signals. U.S. NGA numbers are from Publication 110. 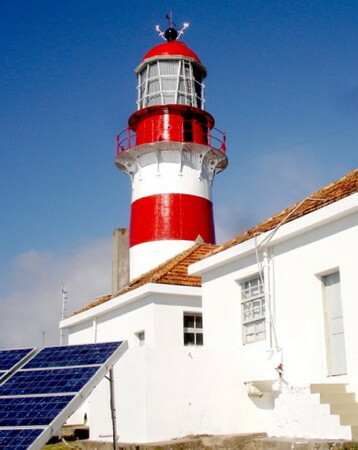 This web site for Brazilian lighthouses has small photos and historical information for many of the major lights. Photos by various photographers, posted by Alexander Trabas. Most of the photos for this area are by Capt. Peter Mosselberger. Photos from Rio Grande do Sul posted on Flickr.com by Gilberto Lima. Photos by various photographers available from Lighthouses.net. Index to articles on the Portuguese Wikipedia. Online version of the official Brazilian light list. 1904. Inactive. 15 m (49 ft) 4-story square masonry tower with castellated gallery; lantern removed. Lighthouse painted white. Google has a sea view and a satellite view. 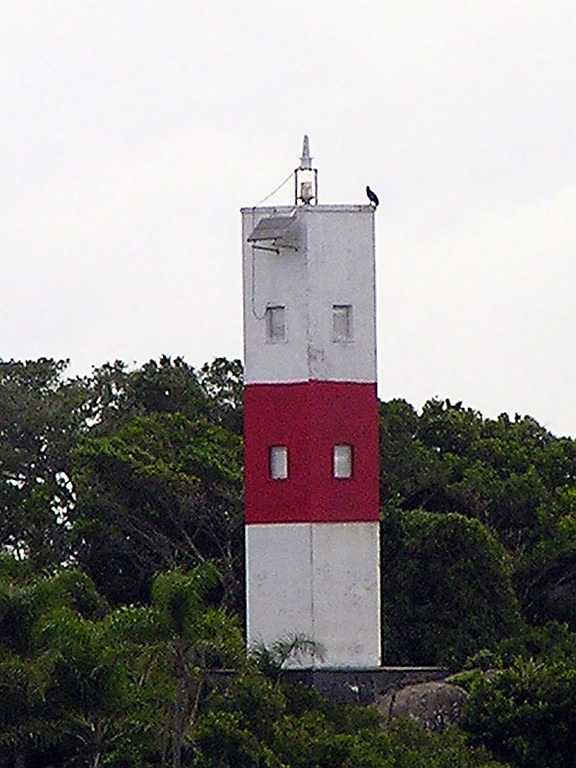 Located at the northern end of the Ilha do Mel, across the estuary entrance from the Paranaguá Range C lights. Probably accessible only by boat. Site open, tower closed. 1872. Active; focal plane 67 m (220 ft); white flash every 10 s. 18 m (59 ft) round cast iron tower with lantern and gallery, painted white. Jorge Gobbi's photo is at right, Wikimedia has several good photos, Trabas has Capt. Peter's view from the sea, Silvio Moraes has a street view from the beach, and Google has a sea view, a street view and a satellite view. This is one of nine cast iron lighthouses prefabricated for Brazil by P & W McLellan of Glasgow, Scotland. The beautiful Ilha do Mel, located in the mouth of the Baía de Paranaguá, is a major tourist attraction easily accessible by ferry from Paranaguá or Pontal do Sul. Most of the interior of the island is an ecological preserve. Located atop a steep headland at the northeastern tip of the Ilha do Mel. Accessible by a hiking trail, popular for its spectacular views. Site open, tower closed. ARLHS BRA-074; BR-3512; Admiralty G0520; NGA 18724. Date unknown. Active; focal plane 43 m (141 ft); white flash every 6 s. 10 m (33 ft) square cylindrical concrete tower, painted white with one red horizontal band. Laudison Moraes dos Anjos has a closeup photo, Elaine Rodio has a 2018 closeup, Trabas has a photo by Mosselberger, Google has a sea view, and Bing has a satellite view. Located near the southern tip of the Ilha do Mel, marking the east side of the entrance to the channel leading to Paranaguá. Site status unknown. ARLHS BRA-023; BR-3550; Admiralty G0524; NGA 18726. Date unknown. Active; focal plane 27 m (89 ft); white flash every 5 s. 9 m (30 ft) tapered square skeletal tower, painted white. No photo available, but Bing has an indistinct satellite view. Located on the southern tip of an island off a promontory on the south side of Matinhos, marking the entrance to the neighboring city of Guaratuba. The island is connected to the mainland by a gravel bar. Site open, tower closed. BR-3692; Admiralty G0538; NGA 18756. 1948. Active; focal plane 9 m (30 ft); red flash every 6 s. 8 m (26 ft) octagonal masonry tower with gallery, painted with red and white horizontal bands. Walter J. Steppan has posted a closeup 2016 photo, Milene de Aragão has a 2017 photo, Everson Mincewicz has a closeup street view, and Google has a satellite view. The lighthouse was previously endangered by beach erosion, with stones placed around it for protection; around 2016 a sea wall was constructed and fill was placed to protect the lighthouse. Located on the north side of the Rio São Francisco do Sul estuary in Itapoá. Site open, tower closed. ARLHS BRA-274; BR-3764; Admiralty G0545; NGA 18764. Date unknown. Inactive since 2018. 13 m (43 ft) square pyramidal white fiberglass skeletal tower. No photo available, but Google has a satellite view. 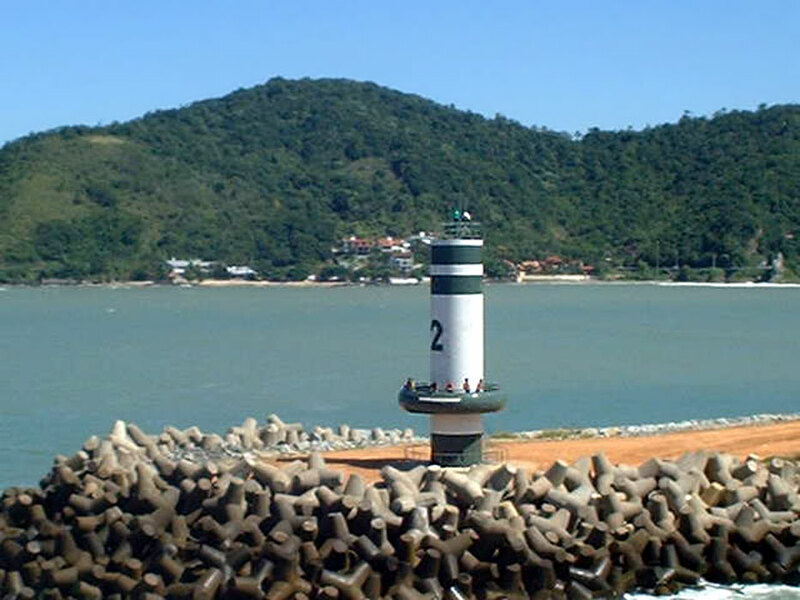 Located on the Ilha de São Francisco do Sul, marking the south side of the harbor entrance. Site open, tower closed. ex-BR-3752; ex-Admiralty G0544; NGA 18763. 1906. Active; focal plane 84 m (276 ft); white light, 3.5 s on, 16.5 s off. 16 m (52 ft) square cylindrical stone tower with lantern and gallery, attached to a 1-story stone keeper's house. The original F. Barbier & Cie. Fresnel lens, removed in 1989, is on display at the Museu Histórico de São Francisco do Sul. Renato Raych's photo is at right, Gislaine Schatzmann has a distant photo, Portuguese Wikipedia has an article with a distant view, a 2017 view from the sea is available, Huelse has a historic postcard view, and Google has a satellite view. According to a July 2007 article, the lighthouse was being restored and would open to the public in 2009 with a museum in the keeper's house; however, it appears that this project was delayed and then suspended in 2012. 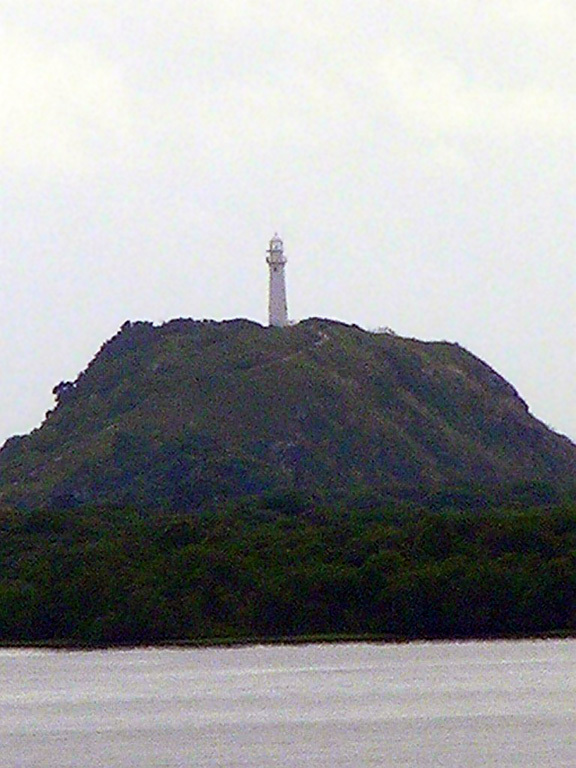 The lighthouse guards the entrance to the port of São Francisco do Sul. Located on an island about 4 km (2.5 mi) off the coast. Site and tower closed (at least in the past, landing on the island required special permission from the navy). ARLHS BRA-137; BR-3700; Admiralty G0540; NGA 18760. 1938. Active; focal plane 16 m (52 ft); three red flashes every 10 s. 12 m (39 ft) 3-stage round cylindrical tower, colored with tiles in red and white horizontal bands. The lowest stage appears to covered with small colored tiles. Rodrigo Osorio has posted a photo, Trabas has a good photo by Capt. Peter, another photo is available, Leonel da Silva has a street view from the south breakwater, and Google has a satellite view. 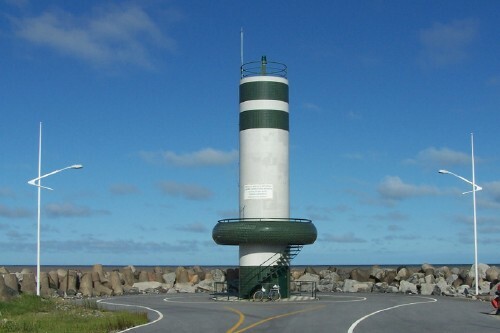 Located at the end of the north breakwater at the mouth of the Rio Itajaí. Accessible by driving on the breakwater. Site open, tower closed. BR-3832; Admiralty G0554; NGA 18800. 1945. Active; focal plane 16 m (52 ft); green flash every 3 s. 12 m (39 ft) round cylindrical tower, colored with tiles in white with green horizontal bands. The tower also has a public observation deck about 4 m (13 ft) above the base, accessible by an exterior stairway. Andréia Bohner's photo is at right, a closeup by Amelie Pouglain is available, Everaldo José dos Santos also has a good photo, Trabas has Capt. Peter's photo, and Google has a street view and a satellite view. 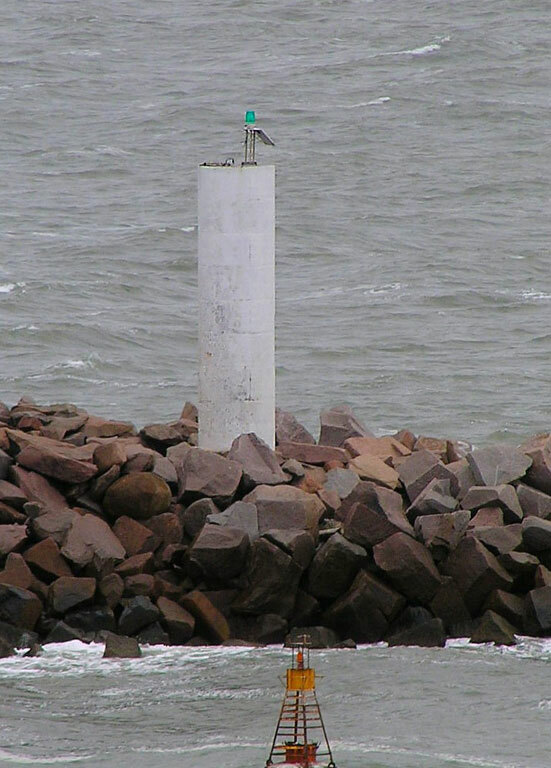 Located at the end of the south breakwater at the mouth of the Rio Itajaí. Accessible by driving on the breakwater. Site open, observation deck open, remainder of tower closed. BR-3828; Admiralty G0555; NGA 18796. Date unknown (station established 1902). Active; focal plane 58 m (190 ft); flash every 10 s, two white flashes followed by one red flash. Approx. 6 m (20 ft) post centered on a square 1-story concrete or masonry keeper's cottage. Lighthouse painted white. Marisco Rio has a 2017 photo, Trabas has Capt. Peter's photo, and Google has a satellite view. Located at the tip of a narrow peninsula projecting northeastward about 4 km (2.5 mi) southeast of Itajaí. Site status unknown (there is a road to the lighthouse, but it may not be open to the public). ARLHS BRA-121; BR-3868; Admiralty G0552; NGA 18788. Note: Ilha de Santa Catarina is an island about 54 km (34 mi) long and as much as 18 km (11 mi) wide, connected to the mainland by several bridges. The island is the location of the state capital of Florianópolis and several popular beach resorts. Date unknown (station established 1939). Active; focal plane 78 m (256 ft); white flash every 10 s. 10 m (33 ft) square cylindrical concrete tower with gallery, painted with black and white horizontal bands. A distant view (1/3 the way down the page) is available, and Bing has an indistinct satellite view. Located atop an island about 10 km (6 mi) east of Canto Grande and the same distance north of the Ilha do Arvoredo. Site status unknown. BR-3872; Admiralty G0558; NGA 18848. Date unknown. Active; focal plane 19 m (62 ft); quick white flash every 3 s. 5 m (17 ft) short mast centered on a square white concrete tower. No photo available, but Bing has an indistinct satellite view. Brazilian sailors use calhau (literally "pebble") to mean a skerry. Located on a rocky reef about 8 km (5 mi) northwest of the northern tip of the Ilha do Arvoredo. Accessible only by boat. Site open, tower closed. BR-3876; Admiralty G0560; NGA 18852. 1883. Active; focal plane 90 m (295 ft); white light with four occultations every 60 s. 16 m (52 ft) round cast iron tower with lantern and gallery, painted with red and white horizontal bands. Fresnel lens in use. Three 1-story keeper's houses. Roger Frony's photo is at right, another page for the lighthouse has a good photo, and Google has a satellite view. The lighthouse was prefabricated in England. Along with neighboring islands, the Ilha do Arvoredo is included in the Reserva Biológica Marinha do Arvoredo, an ecological reserve. Tours of the reserve are available, but it's not clear if these include visits to the lighthouse. Located on an island off the northern end of the Ilha de Santa Catarina. Site status unknown, tower closed. ARLHS BRA-042; BR-3880; Admiralty G0562; NGA 18856. Date unknown (station established 1873). Active; focal plane 39 m (128 ft); red flash every 6 s. 8 m (26 ft) mast with ladder, supported by guy wires, painted white. Fernando Santos has a photo, an aerial view is available, and Bing has a satellite view. Anhatomirim is a small island on the west side of the northern entrance to the harbor sheltered by the Ilha de Santa Catarina. The island is occupied by a well-preserved 18th century fortress, the Forteleza de Santa Cruz de Anhatomirim. NGA misspells the name as Anhatomirin. The fort is a popular tourist attraction, accessible by passenger ferry. Located on the highest point of the island. Site open, tower closed. ARLHS BRA-209; BR-3884; Admiralty G0566; NGA 18860. Date unknown. Active; focal plane 150 m (492 ft); white flash every 10 s. 10 m (33 ft) round cylindrical white concrete tower. Samuel Batista de Souza has a photo, another photo and an extreme closeup are available, and Google has a satellite view. Light lists formerly described the original light, a 10 m (33 ft) square skeletal tower. Located on a promontory on the central east coast of the Ilha de Santa Catarina, about 12 km (7.5 mi) due east of Florianópolis. Site status unknown, tower closed. ARLHS BRA-170; BR-3883; Admiralty G0562.5; NGA 18857. 1861. Active; focal plane 43 m (141 ft); two white flashes, separated by 3 s, every 15 s. 10 m (33 ft) round concrete tower, painted white. Lantern removed, but the watch room with its gallery remains. Andreas Köhler's photo is at right, Zeca Baronio has a 2008 closeup, another good photo is available, Carlos Tuyama has a street view from the base of the lighthouse, and Google has a satellite view. This appears to be the historic lighthouse without its lantern; if so, it deserves much more attention than it has been receiving. Ponta dos Naufragados means "Cape of the Shipwrecked." There's no road access to the site, but the lighthouse can be reached by a hike of about 40 minutes from the nearest road or 20 minutes from the beach below the lighthouse, which is popular with surfers. Andreas Köhler visited this site in early 2009 and reported that the trails are not so easy to follow. 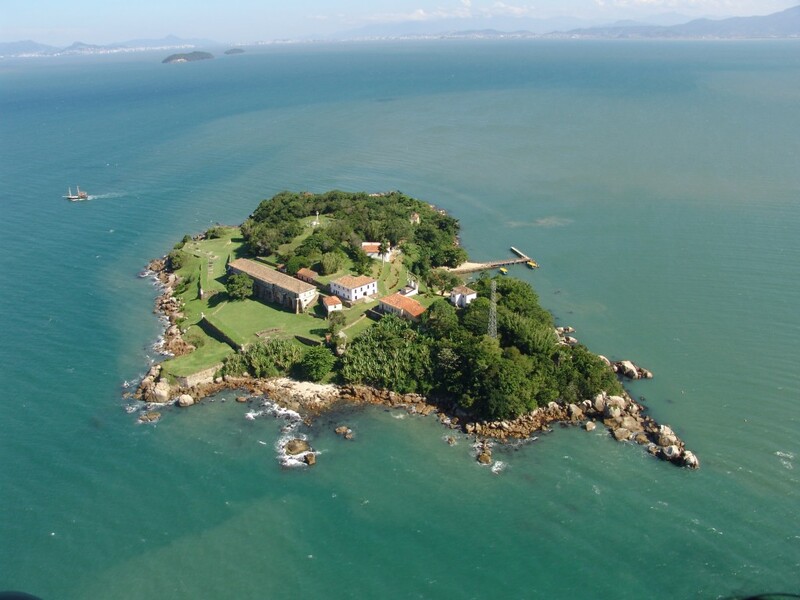 Located on a bluff at the southern end of the Ilha de Santa Catarina about 20 miles south of Florianópolis. Site open, tower open, at least at times. ARLHS BRA-077; BR-3908; Admiralty G0584; NGA 18888. Date unknown. Active; focal plane 81 m (266 ft); white flash every 3 s. 12 m (39 ft) square white concrete tower. No photo available, but Google has a satellite view. Located on heights at the north end of an island about 5 km (3 mi) offshore and 12 km (7.5 mi) south of Ponta dos Naufragados. Accessible only by boat. Site status unknown. ARLHS BRA-041; BR-3912; Admiralty G0588; NGA 18892. 1918 (station established 1882). Active; focal plane 69 m (226 ft); three white flashes every 15 s. 7 m (23 ft) square pyramidal masonry tower with gallery but no lantern, mounted atop a square 1-story masonry service room. Lighthouse painted white. Trabas has a photo by Capt. Theo Hinrichs, Sidnei José Romano has a street view, and Bing has a distant satellite view. The original light was described as an "iron column and house." Located on a bluff on a hook-shaped peninsula sheltering the harbor at Imbituba. Site open, tower closed. ARLHS BRA-055; BR-3924; Admiralty G0592; NGA 18900. Date unknown (station established 1911). Active; focal plane 54 m (177 ft); two quick white flashes every 6 s. 11 m (36 ft) round concrete tower, painted with red and white horizontal bands. Trabas has a photo by Capt. Theo Hinrichs, and Bing has a satellite view. The Ilha das Araras (Island of the Macaws) is a small island about 6 km (4 mi) offshore and 13 km (8 mi) south of Imbituba. Located on the highest point of the island. Accessible only by boat. Site status unknown. ARLHS BRA-040; BR-3936; Admiralty G0594; NGA 18904. Date unknown. Active; focal plane 50 m (164 ft); white flash every 5 s. 6 m (20 ft) round concrete tower, painted white. Trabas has a photo by Capt. Theo Hinrichs, and Bing has a satellite view. Located on the highest point of Ilha dos Lobos, a small island about 12 km (7.5 mi) northeast of Laguna. Accessible only by boat. Site status unknown. ARLHS BRA-138; BR-3940; Admiralty G0596; NGA 18908. 1891. Active; focal plane 74 m (243 ft); white light (red sector covers shoals) occulting three times every 30 s. 29 m (95 ft) square stone tower with lantern and gallery, rising from a square cluster of 1-story keeper's houses and other light station buildings. Entire lighthouse painted white; roofs of the other buildings are red. The original 1st order Barbier, Bénard and Turenne Fresnel lens is in use; the original clockwork mechanism is still in place although no longer used. Edi Galvani Uliano's 2014 photo is at right, Dieter Heiss has a 2009 photo, Felipe Skroski has a photo of the station and the sea behind, Wikimedia has additional photos, Trabas has a distant view by Capt. Theo Hinrichs, and Google has a street view and a satellite view. Built by French contractors, this magnificent lighthouse is one of the best known landmarks of the Santa Catarina coast. Located on the Cabo Santa Marta, a prominent headland about 13 km (8 mi) south of the city of Laguna. Site open, lighthouse and tower open for tours during the summer. ARLHS BRA-032; BR-3956; Admiralty G0600; NGA 18920. 1953. Active; focal plane 85 m (279 ft); three white flashes, separated by 3.3 s, every 20 s. 8 m (26 ft) round concrete tower, painted white with a broad black horizontal band. José Maciel has a fine closeup photo, Caminha da Joinville has a second photo, and Google has a street view and a satellite view. This light stands on the Morro dos Conventos, a rocky bluff overlooking the beach; this is a popular lookout point. Located at the end of the Rua Atlântica in Araranguá about 80 km (50 mi) southwest of Laguna. Accessible by road; parking provided. Site open, tower closed. ARLHS BRA-007; Admiralty G0602; BR-3960; NGA 18924. Date unknown. Active; focal plane about 14 m (46 ft); red flash every 3 s. Approx. 12 m (39 ft) round cylindrical concrete tower, painted white. Google has a street view, and Bing has a satellite view. Located on the north mole at the entrance to the Rio Mampituba, which separates Santa Catarina and Rio Grande do Sul, in Passo de Torres. Site open, tower closed. BR-3964; Admiralty G0603. Date unknown. Active; focal plane about 14 m (46 ft); white flash every 3 s. Approx. 12 m (39 ft) round cylindrical concrete tower, painted white. Sergio Buratto has a good photo, Google has a distant street view, and Bing has a satellite view. Located on the south mole at the entrance to the Rio Mampituba, which separates Santa Catarina and Rio Grande do Sul, in Passo de Torres. Site open, tower closed. BR-3968; Admiralty G0603.2. 1952 (station established 1912). Inactive since 1993. 15 m (49 ft) square white masonry tower with lantern and gallery. Thiago Ferronatto's photo is at right, Wikimedia has several photos, and Google has a street view and a satellite view. The original lighthouse, an iron skeletal tower, was replaced in 1928 by another skeletal tower; both towers suffered from corrosion. The 1952 tower was designed by Roberto Lacombe and Flavio Barbosa. It has been transferred to IBAMA, the Brazilian environmental and ecological institute. 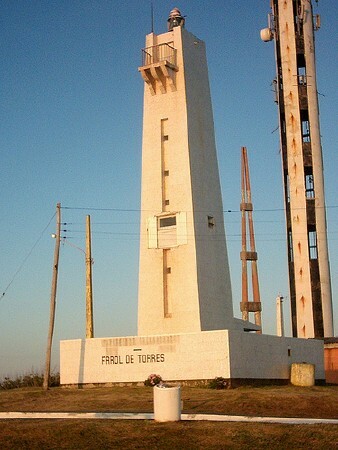 Located atop a high hill, the Morro do Farol (Lighthouse Bluff), in the northern section of the city of Torres, at the northeastern corner of Rio Grande do Sul. Site open, tower closed. ARLHS BRA-273. 1993 (station established 1912). Active; focal plane 85 m (278 ft); white light, 2 s on, 8 s off. 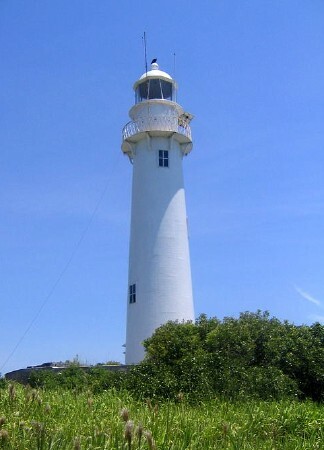 46 m (151 ft) round cylindrical tower; at a distance the lighthouse appears white with black vertical stripes. The lower 2/3 of the tower appears in the photo at right, Lima has a distant view showing both towers, and Google has a street view and a satellite view. Located atop a high hill, the Morro do Farol (Lighthouse Bluff) in the northern section of the city of Torres, at the northeastern corner of Rio Grande do Sul. Site open, tower closed. ARLHS BRA-203; BR-3972; Admiralty G0604; NGA 18928. 1993. Active; focal plane 42 m (138 ft); five white flashes, separated by 5 s, every 30 s. 40 m (131 ft) square cylindrical concrete tower painted white with two red horizontal bands on the lower half. A 2018 photo is available, Jarbas Augusto has a photo, Luciane Huffel has a panoramic view, and Google has a street view and a satellite view. Located on the beach at Arroio do Sal, about 25 km (15 mi) southwest of Torres. Site open, tower closed. ARLHS BRA-270; BR-3974; Admiralty G0605; NGA 18930. Date unknown (station established 1930). Active; focal plane 27 m (89 ft); two white flashes, separated by 2 s, every 10 s. 24 m (85 ft) 2-stage square cylindrical tower with gallery but no lantern, painted with black and white horizontal bands. Aguinaldo Severino has a closeup, Pelas Janelas has another photo, and Google has a street view and a satellite view. The first lighthouse was a 16 m (52 ft) square concrete tower. Located on the beach about 45 km (28 mi) southwest of Torres. Site open, tower closed. ARLHS BRA-021; BR-3976; Admiralty G0606; NGA 18932. 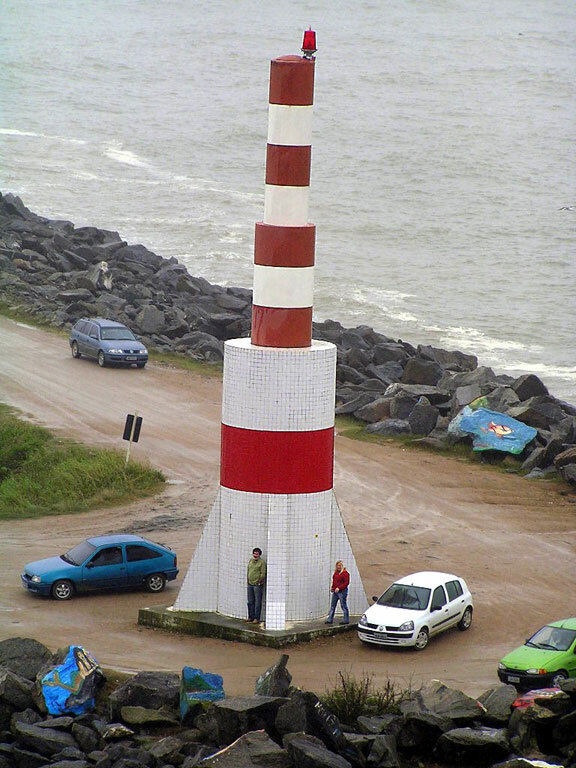 Note: These lighthouses are found along a great beach extending more than 300 km (about 200 mi) southwestward from Capão de Canoa to the Rio Grande do Sul entrance. The northern part of this beach is crowded with resort towns. The southern portion, south of Mostardas, is part of a broad barrier between the ocean and the Lagoa dos Patos; lighthouses in this section are best seen from 4WD expeditions along the beach. Date unknown (station established 1954). Active; focal plane 25 m (82 ft); white light, 2 s on, 13 s off. 23 m (75 ft) round tower with lantern and gallery, painted in a black and white diamond pattern. Lise Pereira has a photo, Ivan Bustamante has a second photo, Google has a street view, and Bing has a satellite view. Located across the Avenida Beira Mar from the beach, at the foot of the Avenida Osvaldo Aranha, in the center of Tramandai. Site open, tower closed. ARLHS BRA-103; BR-3980; Admiralty G0607.4; NGA List 18936. 1933 (station established 1907). Active; focal plane 33 m (108 ft); white flash every 6 s. 30 m (98 ft) narrow round cylindrical concrete tower, its base supported by four buttresses. Tower painted in a red and white spiral (barber-pole) pattern; lantern, gallery, and base painted red. R. Pretto has a photo, a 2017 closeup photo and another closeup photo (second on the page) are available, Google has a street view, and Bing has a satellite view. Located at the foot of the Rua Lupicínio Rodrigues in the resort city of Cidreira. Site open, tower closed. ARLHS BRA-025; BR-3992; Admiralty G0608; NGA 18944. Date unknown. Active; focal plane 42 m (138 ft); white flash every 10 s. 40 m (131 ft) square cylindrical brick (or concrete?) tower, painted white with a black horizontal band. Lima has a photo, Wikimedia has a 2012 photo, a 2015 photo is available, and Google has a street view and a satellite view. Located on the beach at Quintão, in an area called Dunas Altas (High Dunes), about 30 km (19 mi) southwest of Cidreira. Site open, tower closed. ARLHS BRA-210; BR-3994; Admiralty G0609 (ex-G0610); NGA 18945. 1949 (station established 1929). Active; focal plane 24 m (78 ft); two white flashes every 12 s. 21 m (69 ft) red round cylindrical concrete tower with lantern, gallery and four buttresses. The reddish color of the tower appears to be in the concrete rather than painted. A photo is at right, Marcelo Koelho has a photo, Fabricio Padilha Martins has a photo, Rafael Webber has a street view, and Google has a satellite view. The original lighthouse was a 17 m (56 ft) steel skeletal tower. Located on the beach about 70 km (45 mi) northeast of Mostardas and 40 km (25 mi) southwest of Quintão. Accessible by 4WD. Site open, tower closed. ARLHS BRA-100; BR-3996; Admiralty G0612; NGA 18948. 1940 (station established 1894). Active; focal plane 39 m (128 ft); white light on 10 s, off 4.5 s, white flash, off 4.5 s, red light on 10 s, off 4.5 s, red flash, off 4.5 s. 38 m (125 ft) round concrete tower with lantern and gallery, painted with black and white horizontal bands. A Barbier, Bénard & Turenne Fresnel lens (1934) is in use. Miriam de Souza's photo is at right, a 2012 photo is available, Rui Capalonga has a closeup photo, Victor Ferreira has a 2017 photo, and Google has a satellite view. 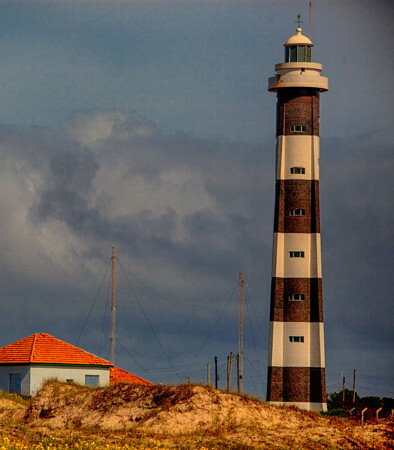 This lighthouse is located in a national park, the Parque Nacional da Lagoa do Peixe. The original lighthouse was a 33 m (108 ft) cast iron tower prefabricated in France. Located on the beach about 20 km (13 mi) south of the town of Mostardas. Accessible by 4WD from the seaside resort of Balneário Mostardense 9 miles northeast. Site open, tower open but the schedule is not known. ARLHS BRA-065; BR-4000; Admiralty G0614; NGA 18956. Date unknown. Active; focal plane 42 m (138 ft); three white flashes every 10 s. 12 m (39 ft) round cylindrical concrete tower with gallery, painted white with one red horizontal band. Antonio Carlos Torres Vianna has a closeup photo and a more distant view, and Google has a satellite view. 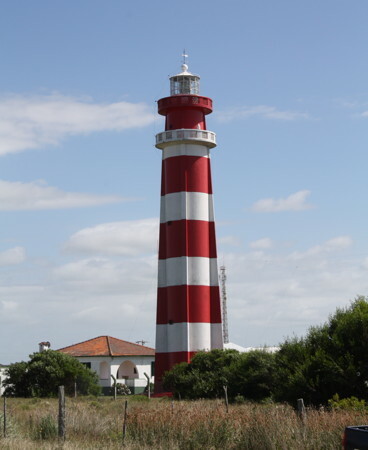 Not to be confused with the historic Capão de Marca lighthouse on the Lagoa dos Patos (see below). Located just off the beach about 40 km (25 mi) southwest of Tavares. Accessible by 4WD. Site open, tower closed. BR-4002; Admiralty G0615; NGA 18959.7. Date unknown (station established 1929). Active; focal plane 33 m (108 ft); white light, 2 s on, 13 s off. 30 m (98 ft) square cylindrical steel skeletal tower, painted red with a white horizontal band. C.W. Bash has posted a photo taken by Rafael Podolano, Jefferson Rodrigues Amaral has a photo, and Cleiton Rodrigues Teixeira has a 2017 photo. 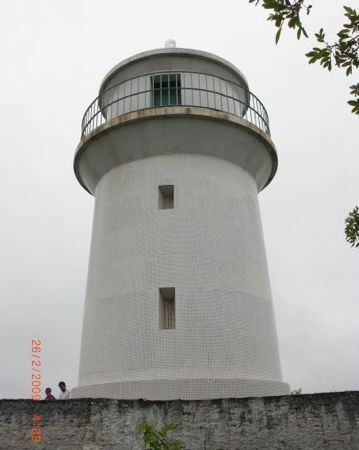 The original lighthouse was a 24 m (79 ft) hexagonal masonry tower that was overturned by beach erosion; Rodrigues Teixeira has a photo of the fallen tower. Google has a satellite view showing the ruins and the new tower. The ruins of the original 1-story keeper's house still stand on the beach. Located on the beach about 65 km (40 mi) northeast of Rio Grande do Sul. Accessible by 4WD. Site open, tower closed. ARLHS BRA-027; BR-4004; Admiralty G0616; NGA 18960. Date unknown. Active; focal plane 42 m (138 ft); white light, 2 s on, 13 s off. 40 m (131 ft) square cylindrical steel skeletal tower, painted white. Wikimapia has photos, another photo (4/5 the way down the page), and Google has a satellite view. Located on the beach about 40 km (25 mi) northeast of Rio Grande do Sul. Accessible by 4WD. Site open, tower closed. ARLHS BRA-212; BR-4006; Admiralty G0618; NGA 18962. 1847 (station established 1820). Active; focal plane 32 m (105 ft); white light on 10 s, then five flashes in the next 11 s. 31 m (102 ft) round cast iron tower with lantern and gallery, painted with black and white horizontal bands. Francisco Parobé's photo is seen at right, Fernando Zafalon Pieper has a photo, S. Masler has a good 2017 photo, Trabas has Capt. Peter's photo, and Google has a good satellite view. Lights are said to have been shown from this point as early as 1698. 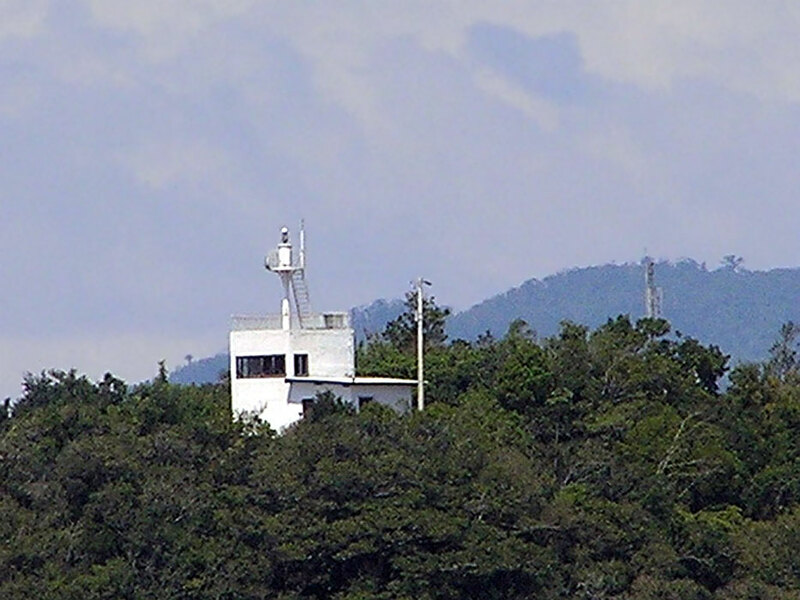 Wikimapia has photos showing the nearby Atalaia tower, which is sometimes described as a lighthouse; it was used for many years as a signal tower, and it carried a light very briefly in 1820. One Wikimapia photo shows the lighthouse behind the Atalaia tower. Other early lighthouses were built in 1840 and 1842. 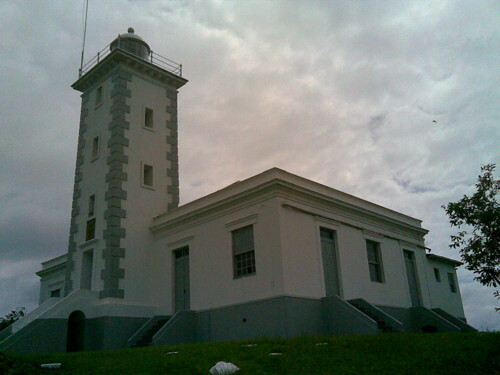 The present lighthouse is the oldest cast iron lighthouse in South America and one of the oldest in the Western Hemisphere. Prefabricated in England, it is a rare example of an early English design. It was installed in 1847 and extended by installation of a larger lantern in 1852. Located on the east side of the Rio Grande do Sul in the village of Povoação da Barra. Accessible by road. Site open, tower closed. ARLHS BRA-245; BR-4008; Admiralty G0620; NGA 18964. Date unknown (recent). Active; focal plane 13 m (43 ft); long red flash every 10 s. 12 m (39 ft) hexagonal cylindrical concrete tower, painted white. No lantern. Rodrigo Borges Da Rosa has a photo, and Google has a satellite view. Trabas has Capt. Peter's photo, which was similar but round rather than hexagonal. 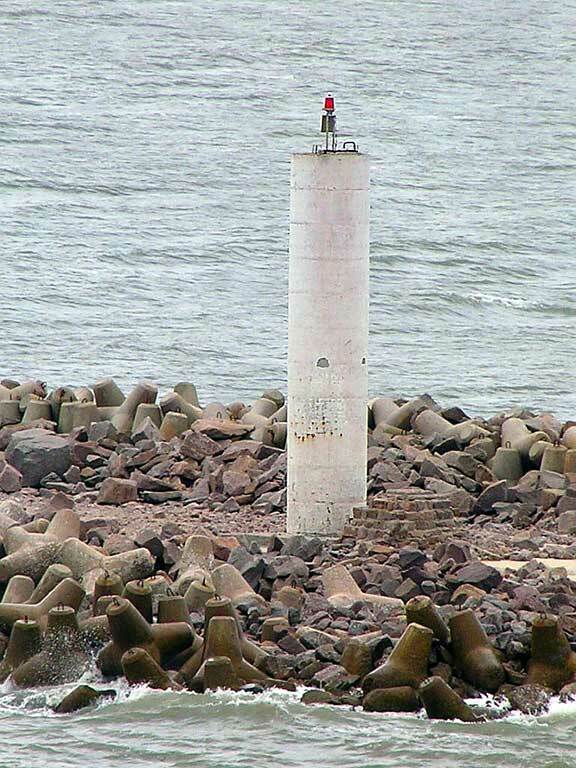 Located at the end of the east mole (breakwater) at Rio Grande do Sul. Site status unknown. Admiralty G0624; BR-4040; NGA 18968. Date unknown (recent). Active; focal plane 12 m (39 ft); long green flash every 10 s. 12 m (39 ft) round cylindrical concrete tower, painted white. No lantern. Access to the light appears to be through a ladder inside the tower. Trabas has Capt. Peter's photo, and Google has a satellite view. Two long (about 2.5 miles) breakwaters or moles (moelhas) were built to protect the entrance to Rio Grande do Sul. The West Mole has been extended recently, and the light was relocated to the end of the extension. Site open, tower closed. ARLHS BRA-246; BR-4044; Admiralty G0622; NGA 18972. Note: The Lagoa dos Patos (Lagoon of the Ducks) is a large lagoon or sound, 280 km (175 mi) long, emptying into the Atlantic at Rio Grande do Sul city. Porto Alegre, the capital of Rio Grande do Sul state, is located at the northern end of the lagoon. 1868. Inactive since the 1950s. Formerly a square masonry tower rising from a keeper's house, the lighthouse has collapsed into ruins. A photo is available, and Google has an indistinct satellite view. The light was replaced by a small red beacon (focal plane 8 m (26 ft); red flash every 8 s) on a pile structure off the end of the shoal. Located on a tiny island off a sandy point projecting into the Lagoa dos Patos about 16 km (10 mi) north of the village of Bujuru. Accessible only by boat. Site open. BR-4464; Admiralty G0631; NGA 18959.5. 1849. Active; focal plane 19 m (62 ft); red light, 2 s on, 8 s off. 14 m (46 ft) octagonal metal cast iron skeletal tower with lantern and central cylinder. Entire lighthouse painted white. João Paulo Lucena's photo is at right, Faroís Brasileiros has a page for the lighthouse, Augusto Lopes Batista has a fine 2017 photo, a closeup photo is available, Rafael Webber has a closeup street view, and Bing has a satellite view. 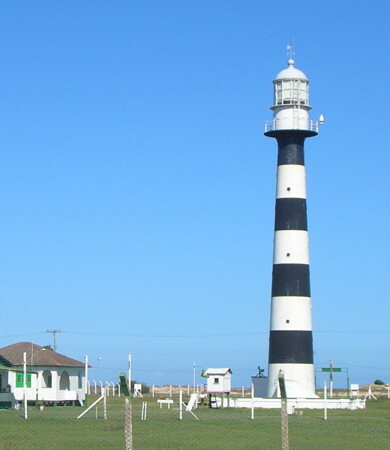 Prefabricated in France by Sautter, Lemonnier & Cie., this is the second oldest surviving lighthouse of Rio Grande do Sul, after the Farol da Barra. The Wikipedia article describes it as inactive, but apparently it has been reactivated. 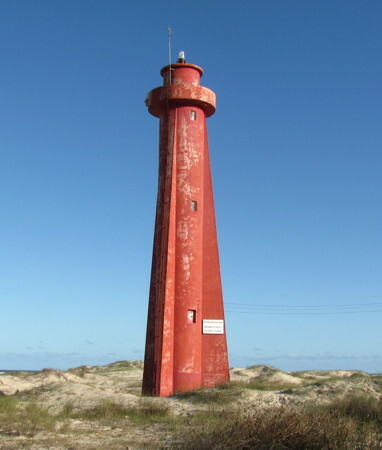 Located on the beach on the east side of the lagoon near Tavares, about 11 km (7 mi) southwest of the Mostardas lighthouse. Accessible by 4WD. Site open, tower closed. ARLHS BRA-127; BR-4472; Admiralty G0631.2; NGA 18957. 1861. Active; focal plane 30 m (98 ft); white flash every 10 s. 28 m (92 ft) square cylindrical brick tower; no lantern. Lighthouse formerly painted white, but almost no paint remains. The keeper's houses were demolished in 1992. Lima has a good photo, Wikipedia has an article (in Portuguese) on its history, and Wikimedia has a good photo by João Paulo Lucena. Endangered: Bing's satellite view reveals that the lighthouse, although protected by a seawall, is nearly surrounded by the waters of the lagoon. In 1992 the keeper's house was demolished and the windows of the tower were removed and bricked over. The lighthouse is named for Cristóvão Pereira (1678-1755), a frontier leader who explored the area and helped establish Portuguese control in the region around 1750. Located on a sandy point projecting into the Lagoa dos Patos about 25 km (15 mi) west of Mostardas and 30 km (19 mi) north of Tavares. Accessible by 4WD. Site open, tower closed. ARLHS BRA-131; BR-4480; Admiralty G0631.4; NGA 18946.9. 1860. Active; focal plane 17 m (56 ft); white flash every 6 s. 13 m (43 ft) octagonal brick tower rising from 1-story keeper's houses. Lighthouse painted white; lantern roof and gallery railing painted red. Jesse Dill's photo is at right, Marcus Guimarães has a photo, Paulo Angonese has another photo, an April 2007 photo is available, Huelse has a historic postcard view, and Google has a satellite view. 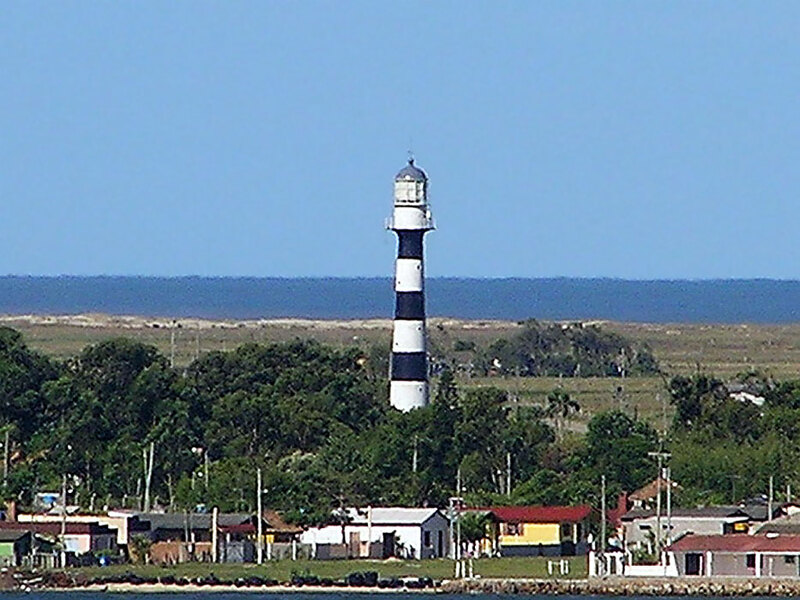 One of the oldest lighthouses in the state of Rio Grande do Sul. In October 2002 the station was transferred to the state government and restored as part of a state park, the Parque Estadual de Itapuã; it is to be used as an educational center. Located at the northern end of the Lagoa dos Patos, on the east side of the entrance to the narrow channel (the Canal da Itapuã) leading to Porto Alegre, the capital of Rio Grande do Sul. Site open, tower open to guided tours from Itapuã on weekends. Accessible only by boat; there are no roads in the area. ARLHS BRA-142; BR-4528; Admiralty G0633; NGA 18946. Note: The Lagoa Mirim is a second lagoon, 170 km (105 mi) long, located to the south of the Lagoa dos Patos and extending across the Uruguayan border. The Lagoa Mirim is connected to the Lagoa dos Patos by a navigable channel (the Canal de São Gonçalo) at the town of Pelotas, west of Rio Grande do Sul. Navigation on the lagoon is limited to small craft. 1908. Inactive since 1964. 16 m (52 ft) square cylindrical masonry tower with lantern and gallery. The lighthouse was painted white originally, but only traces of the paint remain. Lantern painted red. Poti Campos has a good closeup photo, Ancelmo Galarraga has a 2018 photo, Rodrigo de Oliveira has a photo, and Bing has a satellite view. Endangered: the lighthouse is abandoned and vandalized. Recently the city council of Arroio Grande has discussed restoring the lighthouse as a tourist attraction. Located on the Praia do Farol, a sandy peninsula on the north side of the Lagoa Mirim, about 25 km (15 mi) southeast of Arroio Grande. Apparently accessible by 4WD. Site open; tower reported open but dangerous. ARLHS BRA-288. Note: South of the Rio Grande do Sul entrance is another of the world's great beaches. A largely deserted strand that stretches about 220 km (135 mi) from Rio Grande do Sul to the Uruguayan border, the Praia do Cassino is believed to be the longest uninterrupted sand beach in the world. A 4WD expedition the length of this beach will pass five lighthouses, including one in ruins. 1952 (station established 1909). Active; focal plane 40 m (131 ft); three white flashes, separated by 2 s, every 15 s. 37 m (121 ft) square concrete tower with lantern and gallery, rising from a 2-story square concrete base. Lighthouse painted with red and white horizontal bands. Lima has a photo, and Bing has a satellite view. The original lighthouse, a 26 m (85 ft) cast iron tower, was replaced by a second cast iron tower in 1929. Located about 70 km (45 mi) southwest of Rio Grande do Sul. Site open, tower closed as far as we know. ARLHS BRA-098; BR-4648; Admiralty G0636; NGA 19000. 1964. Active; focal plane 15 m (49 ft); white flash every 5 s. Approx. 10 m (35 ft) square pyramidal steel skeletal tower, mounted on a 1-story square pyramidal concrete workroom. Skeletal tower painted red, concrete base painted white. Wikimapia has several photos, another photo (1/3 the way down the page) is available, and Google has a satellite view. Located on the beach about 110 km (70 mi) northeast of Barra do Chuí. Accessible by 4WD vehicle on the beach. Site open, tower closed. ARLHS BRA-207; BR-4652; Admiralty G0639; NGA 19004. 1948 (station established 1909). Active; focal plane 50 m (164 ft); four white flashes, separated by 3 s, every 25 s. 44 m (144 ft) round cylindrical concrete tower with lantern and gallery, rising from the center of 1-story concrete workroom. 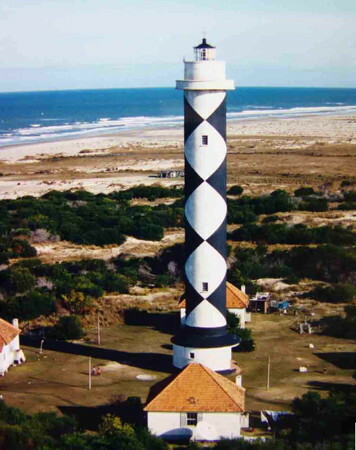 Lighthouse painted in a black and white diamond pattern, said to have been inspired by the Cape Lookout lighthouse in North Carolina. Four 1-story keeper's houses. João Paulo's photo is at right, Lima has a photo, Paulo de Araujo has a closeup photo, Leonir André Colling has a great 2009 photo, and Google has a good satellite view. The original lighthouse was a 35 m (115 ft) cast iron tower. Located on the beach about 90 km (55 mi) northeast of Barra do Chuí. Accessible by 4WD vehicle on the beach. Site open, tower closed as far as we know. ARLHS BRA-002; BR-4656; Admiralty G0640; NGA 19008. Date unknown. Inactive since 1999. Originally a 40 m (131 ft) masonry tower, this lighthouse was toppled during a storm in 1999. Wikimapia has photos of the ruins, and Google has a satellite view. Located on the beach about 40 km (25 mi) northeast of Chuí. Site open. ARLHS BRA-214; ex-Admiralty G0642. 1941 (station established 1910). Active; focal plane 42 m (141 ft); two white flashes, separated by 8 s, every 25 s. 30 m (98 ft) round concrete tower with four narrow buttresses, lantern, and double gallery. Lighthouse painted with red and white horizontal bands. Four 1-story keeper's houses. A Wikimedia photo is at the top of this page, Wikimedia has several additional photos, Carlos Magno Serrano has a 2018 photo, and Google has an anonymous photo and a satellite view. The original lighthouse, a 26 m (85 ft) skeletal tower, was replaced by a concrete tower in 1934. That lighthouse had to be abandoned after a few years because of an unstable foundation. Located at Barra do Chuí, at the mouth of the Arroio Chuí, which is the Uruguayan border. Accessible by road from BR 471 at Chuí. Site open, tower closed as far as we know. ARLHS BRA-024; BR-4660; Admiralty G0644; NGA 19012. Posted January 30, 2004. Checked and revised May 7, 2018. Lighthouses: 47. Site copyright 2018 Russ Rowlett and the University of North Carolina at Chapel Hill.